The warm weather has finally arrived here in New England (oh, boy, has it!) but that doesn’t mean I’m ready to stop eating soup. 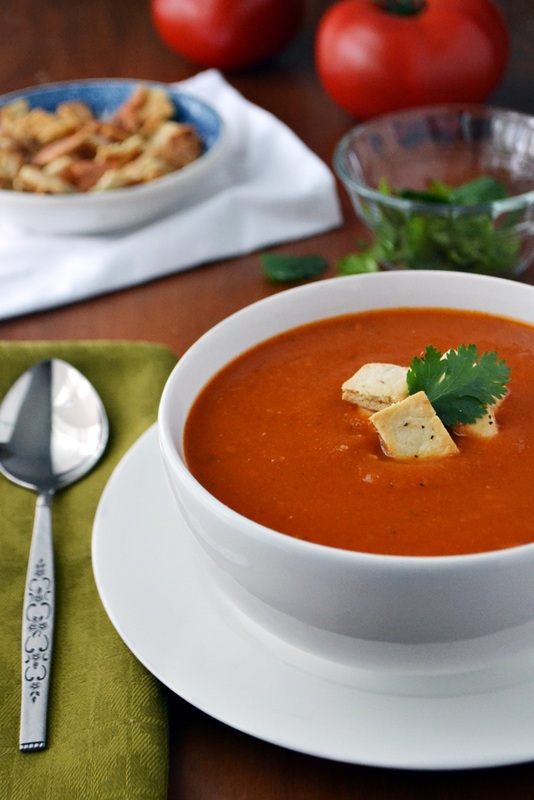 As long as there are cool nights and air-conditioned days, in my life, there will be soup…especially when it’s as delicious as this Spicy Roasted Tomato Soup! When the good folks at Backyard Farms recently asked if I’d like to try some of their Maine tomatoes and share a recipe from their site, I jumped at the chance. “Try” is probably the wrong word, though, since I was already a huge fan. During New England’s long, cold winters (and, let’s face it, our long, cold springs), Backyard Farms tomatoes stick out at the supermarket like Christmas lights in July. Why? Greenhouse-grown on 42 acres in Madison, Maine, Backyard Farms tomatoes are a healthy bright red and (when you bring them home) bursting with vine-ripened fresh flavor — a far cry from the hard colorless varieties imported from far away off-season. I like their “Tomatoes on the Vine” tomatoes for cooking, but the fun little boxes of Cocktail Tomatoes (a bit bigger than cherry tomatoes) are my favorite. Cut in half, they’re ideal for salads, which I also love all year long. 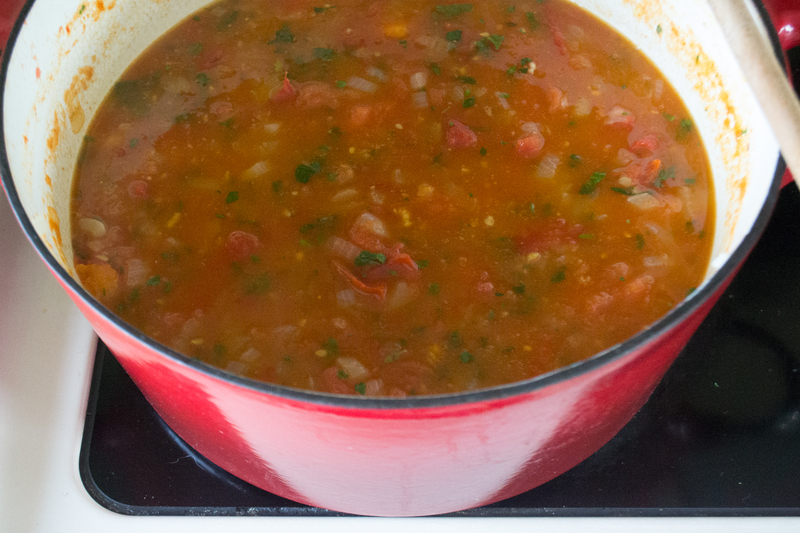 This Spicy Roasted Tomato Soup recipe, on the other hand, called for Beefsteak tomatoes. Backyard Farms Beefsteak tomatoes. Ravishing even in spring. To be more clear, four pounds of beautiful, enormous Beefsteak tomatoes. 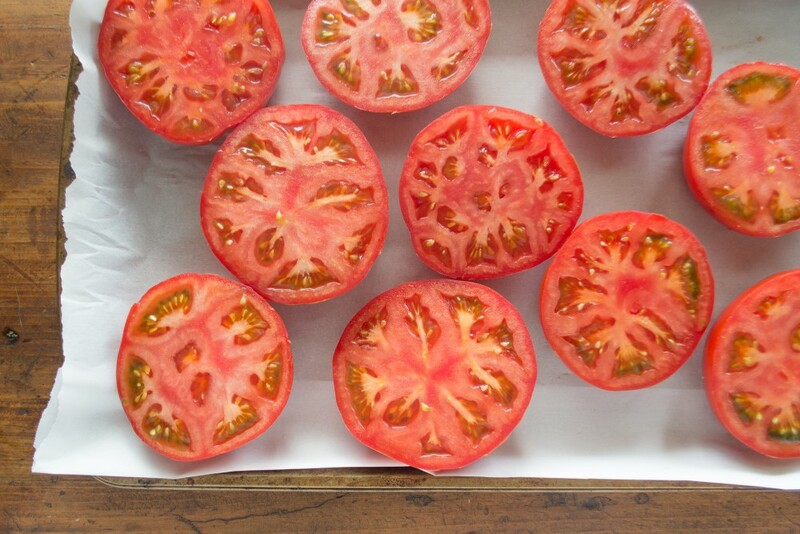 Backyard Farms describes them as “the porterhouse of the tomato family with a flavor profile that’s as big as its size.” Just look at these beauties! Backyard Farms Beefsteak tomatoes, sliced and ready for roasting. The recipe was an easy one. After roasting, the tomatoes are combined (skins and all) with sautéed onion and garlic, then flavored with fresh herbs and plenty of spice. The result is a light and flavorful soup that’s well worth the extra roasting time. The recipe was developed by Boston-based Clover Food Lab. Their food truck was my favorite place for lunch when I worked in the Longwood Medical Area a few years ago, so I wasn’t surprised that I loved this soup, too. My kingdom for a circa 2012 Clover chickpea fritter sandwich and basil lemonade. Sigh. A few notes…the recipe calls for Aleppo pepper, a smoky pepper from Syria, but I couldn’t find it in any of my local grocery stores. It’s available online from Penzey’s (normally my go-to spice spot), but since I wasn’t going to wait for an online order to arrive, I substituted a mixture of four parts sweet paprika and one part cayenne pepper instead, and it tasted great. I also took advantage of my handy immersion blender rather than transferring the soup back and forth between a blender for pureeing. The immersion blender goes right into the pot, making the pureeing process a snap — I love mine and use it all of the time. Homemade pita croutons finish the soup off, but a grilled cheese would also be a great addition if you’re into that kind of thing (which, of course you are). Zippy, easy, and super flavorful thanks to the fresh tomatoes, no matter the season, this Spicy Roasted Tomato Soup is a keeper. 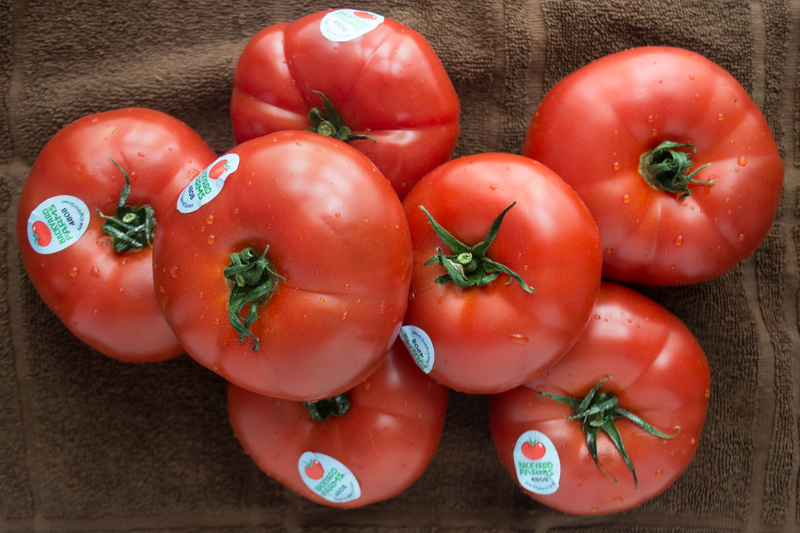 How do you satisfy your fresh tomato cravings year-round? Disclaimer: Backyard Farms compensated me for ingredients and my time for this post, but all opinions are 100% my own. 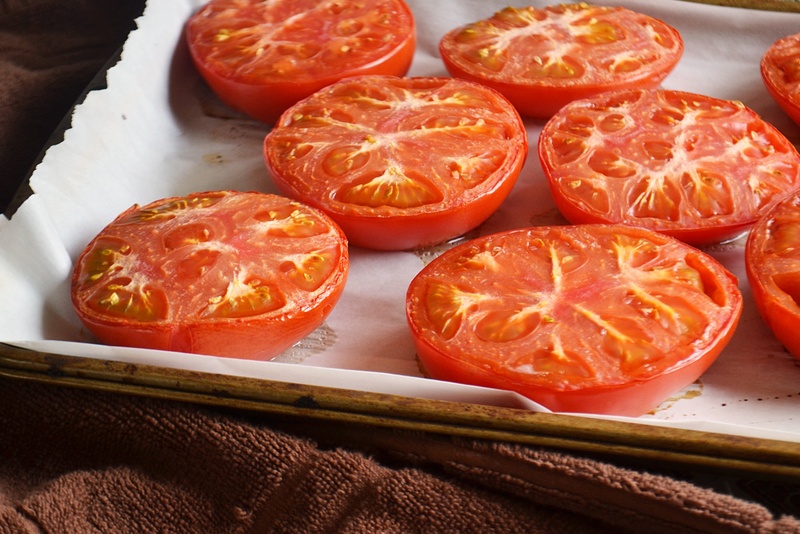 Line sheet pan with parchment paper and roast tomatoes cut side up at 350°F for 30-45 minutes; tomatoes should be lightly roasted. Add oil to soup pot, turn heat to medium and add onions; cook until soft and translucent. Add garlic and roasted tomatoes. Cook for 5-10 minutes. Add cilantro, thyme, coriander, Aleppo pepper, sugar and salt. Cook for 2-3 minutes. Add vegetable stock and red wine vinegar. Bring to a boil and simmer for 30 minutes. Ladle soup solids into blender and cover with cooking liquid until just covered. Gradually run blender from low to high-speed for 30 seconds or until soup is smooth. Empty blender into large bowl; repeat with remaining soup contents in pot. Alternately, you can use an immersion blender and puree the soup right in the pot. Adjust seasoning with salt, red wine vinegar, and sugar. Garnish with pita croutons and cilantro leaves. Garnish: Preheat oven to 300°F. Cut pita into 1/2 inch squares; toss with oil and a pinch of salt; bake for 10-­20 minutes or until crispy. 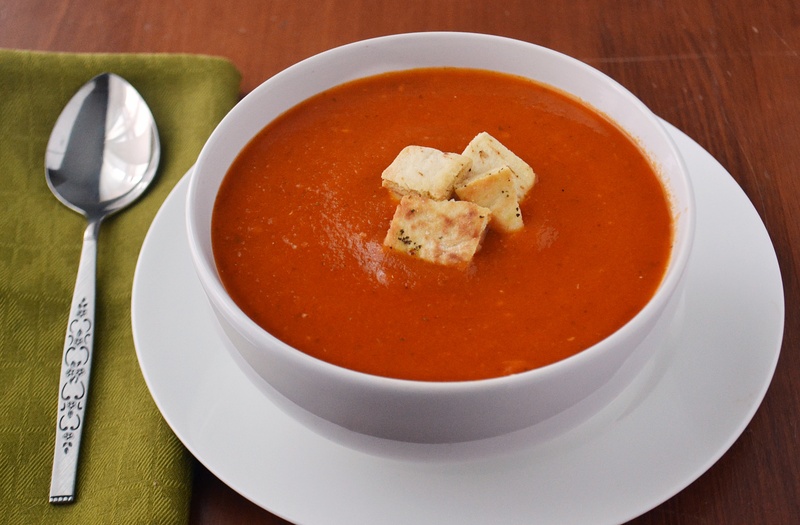 Click to view and print the recipe for Backyard Farms Spicy Roasted Tomato Soup.